Riding for a Fall: The Story of Elisha healing Naaman- Naaman, a general in the army, arrives home after a victorious battle. But while he was gone, his leprosy has spread. He goes to see the prophet Elisha who sends his servant out with instructions for Naaman to follow. 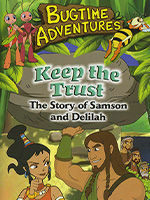 Naaman is angered at Elisha's behavior but follows the instructions and is healed. Meanwhile, Antoni supervises a building project which collapses when he tries to cut corners. As the bugs search for more wood, Antoni convinces half the group to take a short cut while the other half follows the directions. Which half of the group will be successful in their task? Children ages 4-9 will enjoy these entertaining stories as they learn about obedience and following directions. 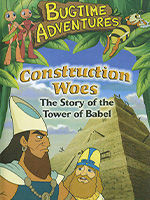 Daniel has achieved great success in working for King Darius, and the other workers become jealous. They trick the king into making a law saying that no one can pray to any god except him. 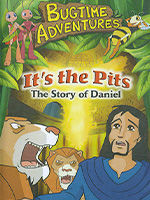 When Daniel is found praying to God, he is thrown into the lions' den where he is protected by an angel. While the bugs are in the midst of their own moral dilemma, they accidentally get rolled up in Daniel's carpet and wind up in the lions' den with him. Seeing the angel protect Daniel convinces them to do the right thing when they return home. Children ages 4-9 will enjoy these entertaining stories as they learn about standing up for what is right. 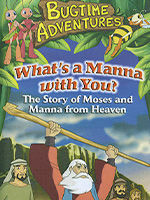 Children ages 4-9 will enjoy these entertaining stories as they learn about loving others as God loves us. 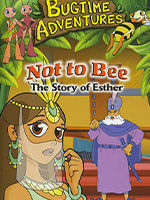 Not to Bee: The Story of Esther -- Haman, a high-ranking official working for King Xerxes, doesn't like the Israelites, so he tricks the king into signing an edict that all the Israelites should be killed. When Queen Esther learns of this, she risks her life to go before the king to ask him to spare the lives of the Israelites. 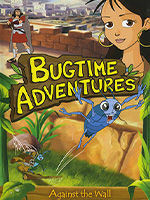 Meanwhile, in the town of Bugglesville, Megan rescues Buzzra, a bee who is stuck in a spider web. Buzzra pretends to be injured so he'll be taken back to Bugglesville. There he plots a way to take over the town with the help of his bee gang. Will this be the end of Bugglesville? 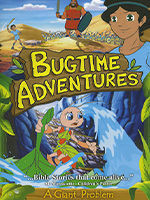 Children ages 4-9 will enjoy these entertaining stories as they learn about courage. Samson is the Hebrew people's protector against their enemy, the Philistines, but no one knows the secret of his great strength. In a weak moment, Samson breaks his vow to God and tells his secret, then discovers he has lost his strength. Meanwhile in Bugglesville, Gina confides in Antoni about her secret fear. When Antoni accidentally lets her secret slip out, the others start laughing at Gina. Gina is hurt and runs to hide. When Antoni realizes he has lost Gina's trust, he decides to make it up to her. Children ages 4-9 will enjoy these entertaining stories as they learn about loyalty and trust. The Armies of Israel are challenged to send out a single soldier to do battle with Goliath. No soldier is courageous enough to take on the task, at least not until little David walks onto the scene. David stoops down and gathers five smooth stones and stands in faith to fight the giant. Meanwhile, at the feet of the humans, another huge drama unfolds as Buggelsville, the tiny bug town, is threatened with total destruction from the cracked and leaking water dam. Spud the potato-bug civil engineer, has figured out a way for someone to plug up the hole before the dam breaks but who will be brave enough to try? Can Megan, the town's schoolteacher ant, gather enough courage to accomplish the job? Morale is low in Bugglesville after they lose a contest, so acting major Antoni suggests a community project to bring them all together again. By working together, a potential disaster is averted. Joseph was sold into slavery by his own brothers and then spent years in jail for a crime he didn't commit. Through it all he kept his faith and eventually found himself in position of authority in Egypt. Joseph now holds power over his brothers and is faced with the choice of forgiveness or revenge! Meanwhile, at the feet of the giants in the tiny bug-town of Bugglesville, Roderick the cockroach embarrasses Antoni the ant at the bug's annual picnic. Using one of his own inventions, Antoni seeks his revenge by setting up a slimy surprise attack that doesn't quite unfold as he had planned. 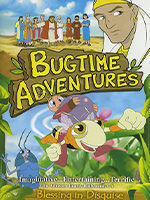 BUGTIME ADVENTURES: WHAT'S A MANNA WITH YOU? As Moses leads the children of Israel toward the promised land, he must deal with their constant grumbling. Even after God provides food and water, they continue to complain. Moses encourages the people to trust God, but their lack of faith results in their wandering for many years. Meanwhile in Bugglesville, Megan begs Antoni to build her a "fan cooling system" just like the one is Prissy's backyard. But part way through the project, Antoni is called away, so Megan tries to finish the job herself, with disastrous results. The people have turned away from the one true God and instead worshiping false gods. After three years of drought, God calls on the prophet Elijah to confront King Ahab and Queen Jezebel who are refusing to follow God's commandments. Elijah proposes a contest between himself and the more than 800 prophets of the false god, Baal. How can one man win against so many? Meanwhile, the bugs also suffer from the drought. The town's water supply is low and Roderick takes advantage of the situation by challenging Mayor Green in the upcoming election. As Mayor Green's new campaign manager, Antoni tries to help by using his new Grind-O-Matic invention, with explosive results. Mayor Green refuses to bend the truth or promise more than he can deliver, but that's not enough to keep the other bugs from being forced by Roderick's false claims and outlandish promises. Will truth win out other lies? Joy to the World: The Christmas Story- When an angel appears to Mary and explains that she's going to have God's baby, Mary agrees to do whatever God would have her do. She and Joseph travel to Bethlehem for the census, but when they arrive at the inn, there is no room for them. The innkeeper lets them stay in the stable where they prepare for the greatest event in history- the birth of Christ. 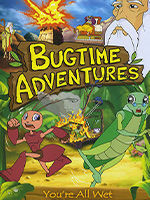 Meanwhile, the bugs need to relocate their town of Bugglesville due to a fire. 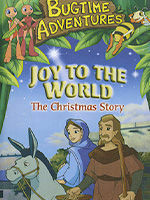 They ride along with Mary and Joseph to search for a new place but find the stable already occupied. They continue to search and eventually wind up back at the stable where they discover the significance of the new baby. Children ages 4-9 will enjoy these entertaining stories as they learn about hope. After wandering the desert for many years, the Hebrew people are eager to reach the Promised Land. However, the enemy city of Jericho stands in their way. Inside this walled fortress lives a woman names Rahab who wants to be free of this unjust city. Rahab helps the Hebrew spies, and in return, they promise to help her entire family escape the city. Everyone expects a major battle, but God has other plans for Joshua and his army. Along for the journey, our bug friends also find themselves up against a wall. Roderick wants to give up right away, but Antoni and Megan know that if they stay on the right path, one way or the other they'll make it through. They try over, under, around, and through the cracks in the wall fail to get to the other side- that is, until Wally steps up. An angel tells Gideon he has been chosen by God to save the Israelites from the Midianites. 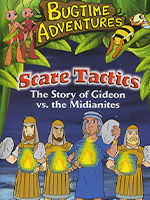 Despite his doubts, Gideon follows God's precise instructions in leading a small army into battle against the Midianites, and the Israelites are victorious. In Bugglesville, a large scorpion named Sickle as taken over the town's food store. All the bugs are afraid of him, but their attempts to force him out fail. They finally decide to listen to Megan and Wally's idea and are able to get rid of the scorpion without using violence. 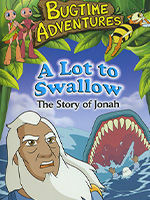 Children ages 4-9 will enjoy these entertaining stories as they learn that God can help us overcome our doubts and fears.